The belt scale market is likely to be valued at approximately US$ 970 million in 2019, witnessing a growth of over 3%. 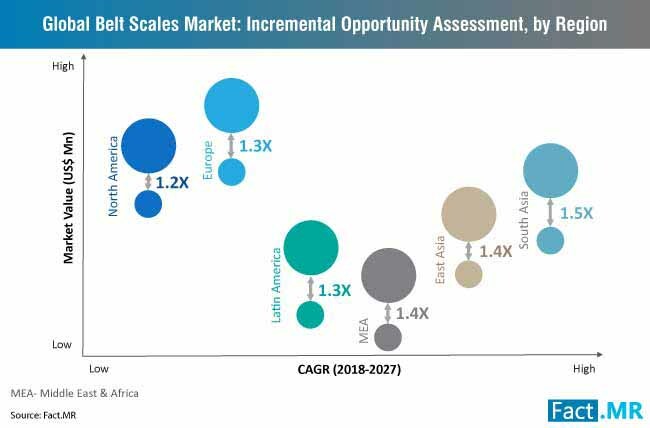 The steady growth in the belt scales market will be driven by a combination of macroeconomic and industry-specific factors, including growing demand for bulk material handling for increased production. According to the study, belt scale systems market growth will be upheld by advancements in the Industrial Internet of Things (IIoT) which is enabling end-users to efficiently manage and maintain conveyor belt scale systems. Integration of advanced sensors in conveyor systems is allowing end-user industries to remotely monitor the functioning of different parts of conveyor belt scales systems. In addition, IIoT technologies are aiding companies across different industries in collecting valuable data which can be leveraged to predict maintenance requirement and evaluate production flows and rates. The study further opines that quick and efficient identification of defective parts in belt scale systems is aiding end-user industries in substantially reducing the downtime. Leveraging its capabilities, companies are monitoring real-time data to optimize production and manufacturing processes. Additionally, remote monitoring, predictive maintenance, and optimization are helping companies reduce dependency on manual labor and save on overhead costs. These factors are vital to the surging demand for automation across different industries which, in turn, is complementing the growth of the belt scales market. Multi idler belt scale systems in dual idlers, triple idlers, and quad idlers are finding increasing application owing to the enhanced accuracy the conveyor systems provide relative to single idler belt scale systems. Multi idler belt scale systems use additional load cells for precise weighing of materials. In addition, the utilization of additional load cells aids in expanding the size of the weighbridge eventually allowing integrators to measure materials for a longer period of time. The inclusion of each new idler enhances the accuracy of the belt scale systems. Multi idler belt scale systems are increasingly being adopted in applications which require precise weight sampling of products or use extremely fast conveyor systems. Additionally, multi idler belt scale systems deliver the same accuracy when used in combination with variable conveyor systems in portable conveyors, stationary conveyors, and feeders making them a preferred choice for integration with already existing systems. Fact.MR opines these factors are crucial in driving the demand for multi idler belt scale systems in end-user industries with this segment estimated to hold 83% of the market share in 2019. Increasing production of novel and innovative conveyor idler maintenance products and services are further expected to drive demand for multi idler belt scale systems during the forecast period. For instance, ESS Engineering, an Australian-based company specializing in conveyor systems management, launched a new belt training device to overcome misalignment of idlers to enhance their longevity. The company also announced the launch of retractable idler frames to simplify replacement of idlers in conveyor systems. Simplification of maintenance processes is likely to cause a surge in the demand for multi idler belt scale systems. Burgeoning demand for food products is estimated to prevail in the foreseeable future with the global population on the rise. In order to capitalize on the increasing demand for food products globally, F&B companies are increasingly focusing on reducing their products’ time to market by leveraging conveyor belt scale systems for bulk handling, weighing, and packaging. In addition, the development of industry-specific conveyor systems is complementing the adoption of belt scale systems in the F&B industry. For instance, Chlorino, a company specializing in the production of conveyor belts, announced the launch of food-grade metal detectable belts which are bacteria resistant and can detect metal pieces three-times smaller than other metal-detectable belts. The Fact.MR report tracks the belt scales market for the period 2018-2027. According to the report, the belt scales market is projected to grow at 3.3% CAGR through 2027.